Jump the job queue using these job search strategies to be successful in the new recruitment environment. This book is for Australian job seekers, new graduates, and new arrivals seeking new jobs – and the career coaches helping them. Your employability makes you attractive to employers, and knowing and showing your employability skills gets you hired. Completing The Australian Career Passport skills audit reveals your Core Skills for Work to present in your resume, your one-page pitch, and in your job interviews. The Passport is suitable for all occupations, and there are special sections for younger part-time workers. This book explains the hiring processes of recruiters and employers. Targeted job search exercises help you adjust to the new recruitment environment. Robotic recruitment approaches are examined, and strategies to deal with Applicant Tracking Systems (ATS) are given. Realistic strategies to work the hidden job market are suggested. Once the employment offer has been made, the negotiation approach ensures a good remuneration package. Using the strategies in the book will empower you to cross the career border, jump the job queue, and be successful in the New World of Work! Lawrence Arnold is a Melbourne CBD career coach, executive coach and career mentor who cuts new career paths for people from all occupations. He enhances their employability by improving their Core Skills forWork, and presenting them effectively to employers and recruiters. 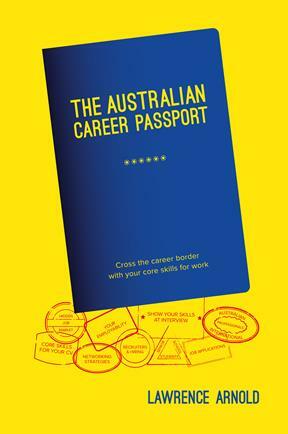 The Australian Career Passport is the result of this approach.